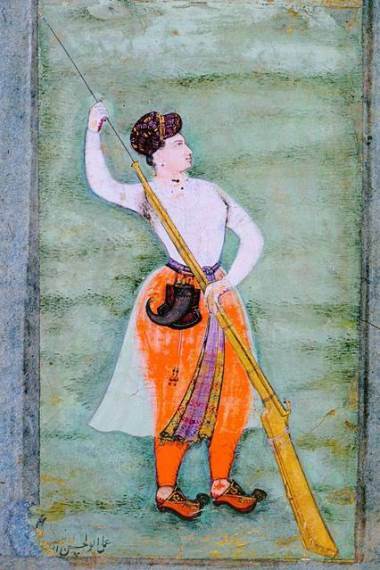 One doesn’t often see empresses portrayed loading a gun, but among the many representations of Nur Jahan, the 17th century Mughal sovereign, the most famous shows her doing just that. She’s standing against a leafy landscape, dressed in a man’s turban, orange trousers and a transparent silk coat. The musket is long and unwieldy, but she handles it with ease. Her posture is confident, bold and self-assured. When the painting was presented to Nur Jahan’s husband, the emperor Jahangir, he proclaimed it perfect and named the court painter Abul-Hasan, Nadir uz-Zaman, the Wonder of the Age. But as the historian Ruby Lal notes in her book, Empress : The Astonishing Reign of Nur Jahan, the true wonder was the subject of the painting herself. Nur Jahan (1577-1645) was born Mihr un-Nissa, a daughter of Persian nobles who left the repressive conditions of Safavid Iran for the greater freedom–and wealth–of Mughal India. She became Nur Jahan, the Light of the World, when she married Jahangir in 1611. She was an unconventional imperial spouse, because she was not only past the nubile age–she was 34 at the time of their betrothal, but also a widow and a mother. Records don’t tell us exactly how the meeting between Mihr and Jahangir happened. What we know for sure is how much the emperor esteemed his wife, describing her bravery, archery and shooting skills, her wisdom, and her generosity at length in his journal, Jahangirnama. As Jahangir’s health declined, in no small part due to his opium and alcohol addiction, he entrusted power to Nur Jahan. She issued imperial orders in her name, appeared at royal functions alongside the emperor and minted coins that bore her name, an unprecedented move in the Mughal empire. She was both feared and respected, lauded and judged. Even as many nobles were uncomfortable with a powerful female figure at the helm of the state, Nur Jahan’s achievements couldn’t be denied. Lal’s book brings Nur Jahan’s character to light. Many other historians gloss over her, either focusing on the great Mughal monarchs like Akbar (1542-1605) or his grandson Shah Jahan (1592–1666) or dismissing the idea that a woman in Mughal India could wield real power. It’s a shame, because hearing a diversity of voices makes our understanding of the past greater. While Nur Jahan lived in a conservative, patriarchal society, she nevertheless showed that the boundaries were less rigid and the limitations less severe than might seem at first glance. Nur Jahan’s is an inspiring and engrossing story, and I read it in one evening, stopping only to search for images of the mosques, public baths, gardens, and mausoleums designed by the empress that still grace Agra, Lahore and Delhi. (Lal’s book includes several color plates, but I wanted more.) Not only Nur Jahan, but also other Mughal characters, parade before our eyes, from Jahangir himself, a man fascinated with the natural world and philosophy, to Gulbadan Begum, the first Mughal historian. Lal’s book recreates vividly the world of the Mughals–the pleasure gardens, court painting sessions, travels to Kashmir, celebrations as well as intrigues and insurrections. Perfume lovers will appreciate the story of how rose essence was discovered–courtesy of Nur Jahan’s mother. The anecdote was touchingly recorded by Jahangir in his journal, and Lal explains its significance. As I was reading, I was thinking how easily remarkable individuals, especially women, can slip out of our gaze, since historians have their own prejudices and blind spots. It doesn’t mean, however, that they are not there. As Lal aptly reminds us, some individuals write themselves into history, and Nur Jahan left many tangible clues to her larger-than-life personality. Ruby Lal. 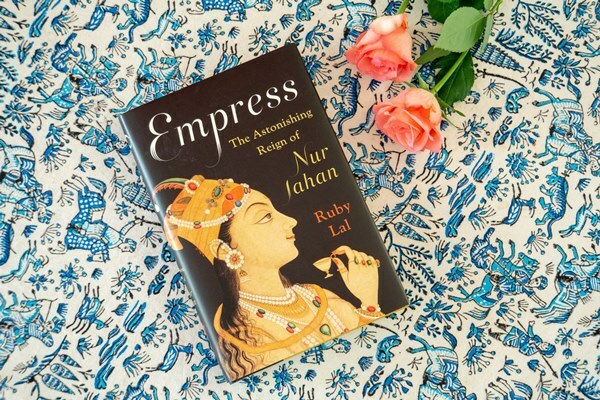 Empress : the astonishing reign of Nur Jahan. New York, NY : W.W. Norton & Company, 2018 (public library). I am reading this one right now! Very good so far! Thank you for this review and I hope other readers of this blog will become interested so we can all discuss. At the same time (am I the only ones who reads 2 books at a time?) I am reading Call me Zebra by a young talented author Azareen Van der Vliet Oloomi. Victoria: I also read more than one book at a time, and right now I’m also reading Ella Maillart’s The Bitter Way, about her journey through Central Asia and Afghanistan on the eve of WWII. Sandra: Is there another title for you book by Maillart? I couldn’t find it. Maybe its not released in the USA. Sand is good, Herrndorf writes with a bit of humor. It is a book that demands your attention though or else you will not be able to connect the dots. Victoria: Let me check. I think it’s The Cruel Way (La Voie Cruelle in French). Victoria: Yes, it’s The Cruel Way. I will add this one and the rebel sultans to my autumn reading list. Its been really hot here in NYC. We have a heat advisory and I have been keeping my two little kiddos cool. Today I am in Songes. Emilie: This is true 🙂 You will always discover new facets or insights each time you read a really wonderful book. Silvermoon: Absolutely intend to read this one. I was always fascinated by Nur Japan when studying history in school in India. Silvermoon: Victoria, I would recommend it very highly. Eleanor was a formidable woman- wife of two kings and mother of kings. A strong, intelligent and highly cultured woman. And the book is an excellent one. Hope you enjoy it.